This has been addressed in a recent patch. If you are still encountering this error, please reach out to support and they would be happy to assist. I don't see any sort of link to the current associate invoice (or invoices) on the Ticket page. This is causing a hassle because I see the ticket charges, but I'm not sure how many of those charges have already been applied to an invoice. The status of 'Add/View Charges' never changes, even after they've been added to an invoice, so I've accidentally created multiple invoices. Can this be resolved? When Store A makes an invoice, and Store B presses "Print", it will print to Store A, even though Store B pressed print. I would love to see an option where, in AutoPrintr, no matter which store makes the invoice, whichever store *requests* the print, gets the print. I would also suggest that for Dymo labels, if possible. Cannot view all open estimates in customer portal! 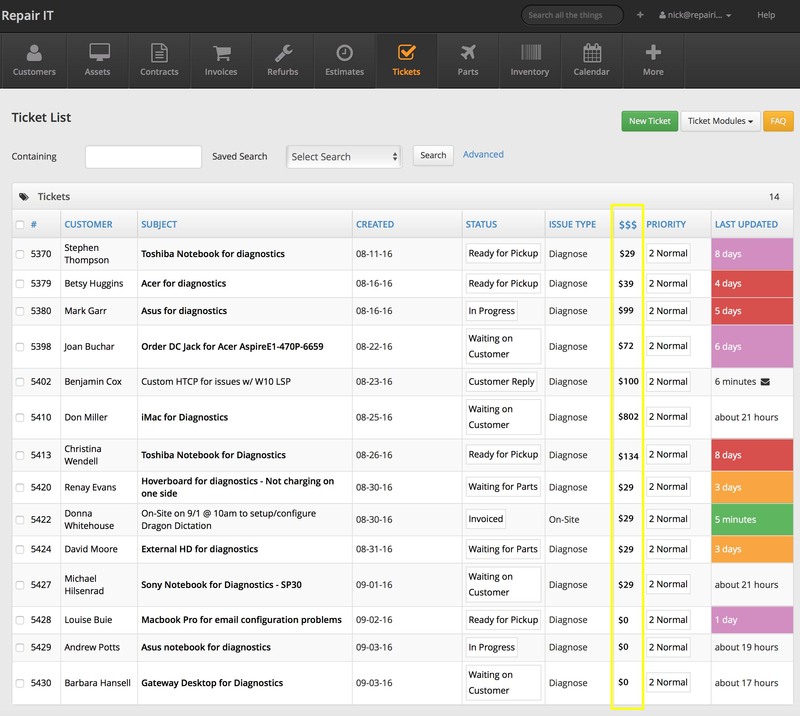 I recently sent 27 repair estimates to a customer and told them to approve/decline in the portal. They approved 8 of them, and there was no activity for another week on the rest. Got an email this morning asking when I was going to send the other estimates. Turns out the customer can only see the first 8 in the portal, and there is no "View All" button as there is for Assets, Tickets, and Invoices. I have verified this on multiple browsers and computers. Is this normal behavior? I have verified this on multiple computers and browsers. I see no reason customers should not be able to get a full list of open estimates waiting for approval/decline. I’m happy to say that we have updated the Customer Portal and customers are now able to click a View All button to view all Estimates on their Customer Portal. I don't know if it is already an idea out there, but it would be great to have an email receipt automatically sent to the customer after they make a payment with credit card online or after a recurring payment is processed. This is mostly an issue in the app (I'm using an iPad). If more than one worksheet is attached to a ticket, you have to scroll through each worksheet. It would be less annoying if we could collapse an individual worksheet while keeping another open. Also, it's super annoying that every time we update a field, the page refresh takes us back to the top of the ticket. :/ I'm finding the iPad app to be buggy in various, frustrating ways. It would be helpful if this report also included the Invoice Date, as well as the due date. This update will go out today, thanks! As it currently stands there is no way to make the worksheet required before ticket progress which defeats the purpose of post checklist repairs as techs could just forget to do it. Unfortunately the Square integration for iOS and Android App only works if you are in the US. What about the rest of us who are not in the US? This shouldn't be that hard to do. Square already has integration in Australia for Xero so the functionality must be already in Square it's just a matter of making Repairshopr do the same. 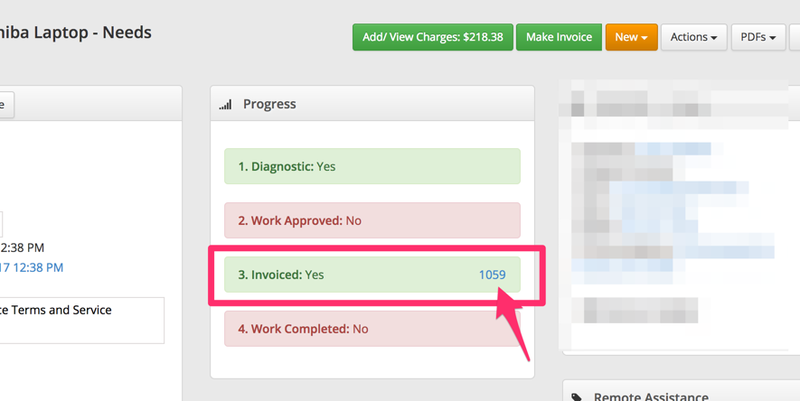 It would be great to have <<Invoice Total>> as an available tag in the email template. Our old system showed the client what the total was in the email, so they were used to seeing that figure without having to log into the portal or open the PDF. As an extension to this, it would be great to also have <<Outstanding Balance>> as a tag as well. All invoice tags are supported in invoice email templates. This part of the application needs more documentation. We’re working on it. This has been resolved in a past update. Please verify that you are on the latest build of the Android app by making sure it is updated via the Google Play Store. I would like a button on the ticket that allows you to go directly to their wiki page. We are trying to encourage use of it and this would help. Hey everyone, I’m happy to announce that you are now able to easily get to the Customer Wiki from within a ticket. Now all you have to do is click Action > Customer Wiki to navigate there! No more having to jump around! Kind of like quickbooks used to do. I would like a couple of boxes that total the cost, and the profit we would be making on this estimate. Also, it would be handy if it showed a percentage for the profit vs the estimate total so you could also see the markup percentage total for the estimate. This would help a lot for projects we quote. A way I can search through bundle items easier to locate a particular bundle i'm looking for. We use a lot of bundles and when our techs go to look up a current price for something, the search for a bundle item is a bit archaic and you have to hit Ctrl-F and hope its on one of the many pages of bundles. With our new bundles update you can search the Inventory page for “bundle” and then use the sort functionality.